Or est Baiars en Hure! Sweet stay awhile, why will you rise? Here is an interesting pair of rereleases. 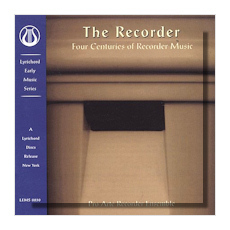 The disc of recorder music offers thirty tracks, and more than that many pieces since some cues contain more than one selection. Many are around just a minute's length, some much longer, including a sonata by Baroque composer Marcello that clocks in at 7:20. It is, in fact, the Baroque selections that are the most significant here. The Marcello sonata (in D minor) features accompaniment by harpsichord and viola da gamba, and offers substantive music in a slow-fast-slow-fast structure. The Hotteterre Les Delices – Le Champêtre are duo pieces for contralto recorders, also with harpsichord and viola da gamba accompaniment, that are charming, delicate and graceful, occasionally calling Bach to mind. Ethereal and dreamy describe the mood of Couperin's delectable Rossignol en Amour. There are other Baroque selections by Van Eyck, Finer, and D'Aquin, all of considerable interest. Other music here from earlier periods includes that of Alphonso El Sabio, Adam de la Halle, Des Préz, Weelkes, Henry VIII, Attaingnant, and many others. I would say there's not a selection here that won't be of at least mild interest. The Henry VIII If love now reigned and En vrae amoure and the Two Spanish Songs (Torre de la nina by Ponce and the anonymous Meu Naranjedo) were originally accompanied by poetic texts but are here presented instrumentally only and sound quite effective that way. Some of the anonymous pieces, like the brief 7th Royal Estampie, Le Ductia, and Saltarello, all from the 13th Century, have a lively, infectious charm that invokes Medieval sun and joy. All in all there's much to enjoy here for recorder fanciers. Performances by this Argentinian group are spirited and idiomatic throughout, with never a hint of technical failing, no mean feat since some of music here is quite challenging. The sound (from 1977) and notes are excellent. 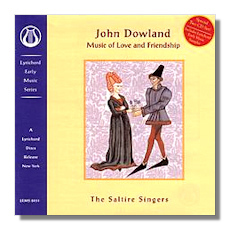 The Dowland disc is truly charming. It features, for example, sparkling renditions of Sweet, Stay Awhile!, What if I Never Speed?, and Say, Love, If Ever Thou Didst Find. This British ensemble delivers an appropriately dark rendition of In This Trembling Shadow, and a touching, reverential account of Where Sin Sore Wounding. The solo work by Patricia Clark and Edger Fleet in Tell Me, True Love is convincing and beautiful. I can't find fault with the performance of any song here, each seeming a near perfect realization of the work in authenticity and musicianship. The sound, especially for its early 1960's origins, is more than acceptable, and the notes good. This release also contains a bonus CD, a sampler featuring selections from some of Lyrichord's recent popular issues: Saltarello & Trotto (from Istanpitta!) by New York's Ensemble for Early Music, two Kyries sung by Schola Discantus, Lute music performed by Joseph Iadone, flute duets performed by Tom Moore and Kimberley Reighly, and many more. Dowland fanciers, and those whose budgets preclude purchase of many of Lyrichord's other offerings, will find this set most attractive.